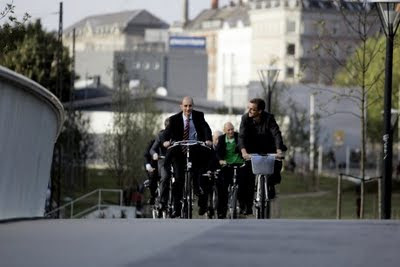 The British Transport Minister, Andrew Adonis, visited Copenhagen a few days ago and went for a bike ride around the city to pick up ideas and inspiration for Britain. Here he is, above, moving up and across the bicycle bridge over the busy Aa boulevard. He was accompanied by the British ambassador to Denmark, Nick Archer and a delegation of City officials. "I'm impressed. You have many helpful ideas", he said to the press. "We have a lot to learn." Most importantly, he rounded off the bicycle ride through the city by saying "I felt safe", regarding the city's separated infrastructure.